We are ready to go riding at our favorite spot in the desert! Since 1999 BAS has been hosting this trip for great desert riding while connecting with the best people. This trip is for everyone! Families of all ages and riding abilities love this trip. Though the trip is posted for Friday-Sunday, many come as early as Wednesday to get many more days of riding. Show up when you can and our volunteers will help get you situated in a great spot. Lodging options are two: Stay in the town of Yerington at one of several hotels or stay at the Staging Area in an RV, Trailer, or Tent. Saturday is our main day with many different guided routes to the Microwave Tower and the Pine Grove Ghost Town area. Lunch is provided at Pine Grove. After riding all day, join the group at Round Table Pizza in Yerington for a discounted dinner and time to swap stories of the day’s ride. Sunday morning has three great components before getting back on the bikes… 1) A full, hot breakfast! 2) A short sermon from Adventure Sports Pastor Greg Weisman 3) A phenomenal drawing where everyone wins big! All those wrap up by 10:30am so we can get back out on the trail. Check-In Team. We could use some help getting people checked in when they arrive - making sure they are registered and waivers are signed. Lead a ride on Saturday. We need ride leaders who know the area, can troubleshoot along the trail, and who can keep it fun. Choose taking beginners, intermediate riders, or advanced riders. Be on the Pine Grove Team. On Saturday we always need at least two pick-up trucks to go Pine Grove with gas cans and lunch supplies and host the group as it arrives with a hot dog lunch. The trucks always seem to bring at least one bike and rider back to camp. Be on the Food Team. Supplies for lunch on Saturday and breakfast on Sunday need to be purchased (you are reimbursed) and both means need to be prepared. Be on the Prize Team. We always need more prizes and then we need a crew to set up and distribute prizes. BAS is a self-supporting 501c3 Organization and as such, we have overhead for these trips. The registration fees covers our insurance, BLM permits/use fees), administrative help, website team, etc. We will have a table set up at the Staging area Saturday morning for people to check in - but pre-registration is required at link below. Take 208 or 339 South 12 miles to the Walker River. RIDING: Riding is great for all levels, beginner to adult as the desert offers 4WD roads for beginners and sand washes, hill climbs, ridge trails, & technical canyons for those wanting a challenge. The Wilson Canyon Staging area is terrific as parents can sit on a knoll and keep an eye on the kids while they ride an expansive area. For those who want a longer, guided ride on Saturday – there are several options to the ghost town, to the microwave tower, or advanced desert rides. ​HOTEL OPTIONS FOR LODGING: BAS blocks out 12 rooms at the Yerington Inn Hotel for Fri-Sun, which are available on a first-come, first-served basis (they release the rooms after 4/17 - so don't wait too long to reserve!) Rate is $99 + tax/night. 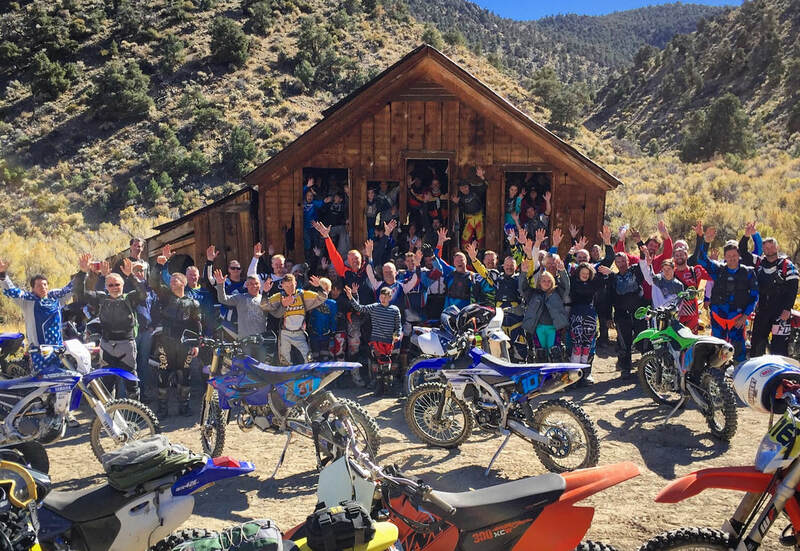 To make reservations at the Yerington Inn, call (775) 463-5310 and tell them you are with the Bayside Dirt Bike Group (please put on your own credit card) - if those aren't available, they may have other rooms open. It is located at 4 North Main Street, Yerington, Nevada 89447. There are also two other motels in town - Victorian Rose (775) 463-2164 and the Copper Inn (775) 463-2135. FOOD: We have lunch on Saturday and breakfast on Sunday. For other meals, you can bring your own or eat out but plan to join the group in Yerington on Saturday at Round Table Pizza*. Then on Sunday morning we’ll have a group meeting about 9:30-10:30am with a short message from President/Founder of Bayside Adventure Sports, Greg Weisman followed by the always-fun Yerington drawing. SHOOTING IN THE DESERT: Do you enjoy firearms? Many who come to this Yerington trip do so they bring an assortment of handguns, shotguns, and ARs. This is self-regulated at a very safe location away from the group. If you are bringing firearms, please practice safe habits in how you transport your gear. It will be held at 4:30 pm on Saturday. Participants will bring their own guns and ammo. We will provide some fun targets. It will last about 1 hour. Some will have dinner at the El Superior Mexican Restaurant, about 6:30pm in Yerington. 21 W Bridge St. (775) 463-2593. The fun starts at the Riding Area too... join around the campfire. 9:30am Rider’s Meeting at the registration area. Prize Tickets for sale at Round Table (credit sales available here, not at Wilson Canyon). 8:30am Free Breakfast at Staging area! Pastor Greg Weisman followed by the Prize Drawing! 10:30ish Hill Climb Fun across the street then time for more riding!